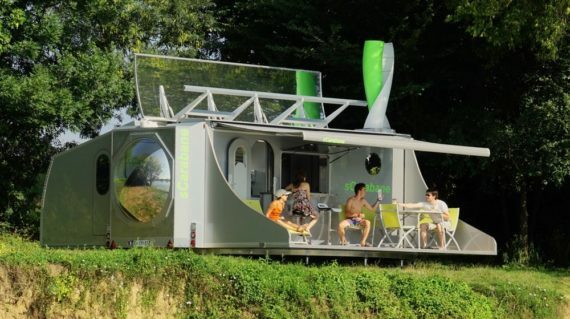 The sCarabane travel trailer hits all the trendy buttons, from tiny house living to solar hot water to solar- and wind-generated electricity, but this caravan concept may be more of a crowd-pleaser than an actual feasible product. Whether it’s primarily for road trips or just for living more simply, the idea of going completely off the grid while enjoying the amenities of modern technology is a worthy goal, and the sCarabane is an attempt to flesh out that concept. The project was originally developed by France’s Fillon Technology from 2013 to 2017, but is now being furthered by an independent company, Green Cat Technologies, with its sole focus being the development of this green caravan, while Fillon remains a partner in the project. The sCarabane is a pull-behind travel trailer that, aside from the giant bubble window in the rear, looks like any other cargo trailer until it’s unfolded all the way, at which point it becomes a futuristic feature-packed vacation home with all of the bells and whistles. The interior, while appearing more open and light-filled than the average trailer, is designed to do exactly what all RVs and campers do, which is to become a home on wheels. A covered deck offers protected outdoor space with a mini-bar for eating or socializing, a rear sleeping area features both a 77.5 square foot master bedroom and another 59 square foot bedroom, and in the main section, there’s a full kitchen with a dining area that can convert into another bedroom, and a full bathroom completes the interior. The sCarabane is designed with multiple renewable energy technologies, such as a 500W rooftop solar array, a solar concentrator with a sun-tracking parabolic mirror for producing hot water, a pop-up 500W vertical axis wind turbine (VAWT). Two adjustable windows (“rose windows”) help the residents maximize natural light. A large bubble window can be rotated to adjust the lighting levels inside. The sCarabane measures 7.8 meters long by 2.5 meters wide by 2.8 meters high when folded for transport, and it folds out to about 7 meters in width. The empty weight of the caravan is about 2,500 kg.